This course is intended to introduce the basic concepts to use SAS, in a simpler manner to researchers who are in need. 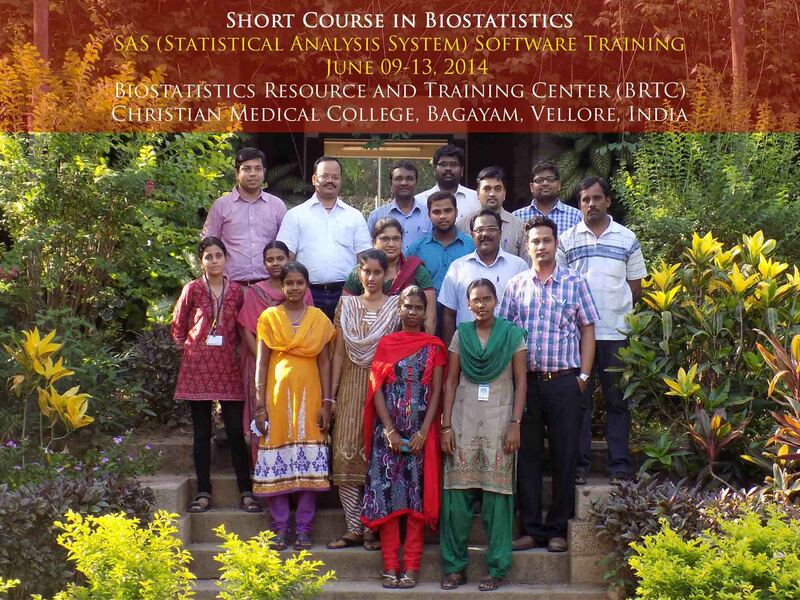 This course is also planned to furnish the basic and some advanced statistical analyses techniques with real time datasets so as to improve the participant's ability to understand and interpret the findings. The course is targeted towards researchers of varied profession such as medicine, public health, life science, social science, nursing, epidemiology, biostatistics etc. Note: The participants should have basic knowledge in computers. Participants will have to bear their own expenses for travel, boarding and lodging. The Organizers will give Course kit, Lunch and Snacks. However the organizers may arrange basic accommodation with A/C facility in the college campus on request. Only limited accommodation available in the campus and priority will be given to the female participants. Course Fee should be paid in full by May 10, 2014. Payment can be made by Demand Draft in favor of "Christian Medical College Vellore Association Account", payable at Vellore. The number of participants for each course is limited to 30 and admission will be purely on first come first served basis. Data Management Facility, Structure of SAS program, Data Analysis and reporting utilities. Creating permanent libraries, using temporary and permanent data set within the libraries, Methods of importing data into SAS and saving datasets in SAS libraries. Creating new variables, operating logical expressions, recoding, variable and value labeling, sorting. Renaming and retaining variables, Do Blocks & Do Loops, sub-setting datasets (select), working with arrays, generating multiple datasets, merging files, reshaping dataset. Parametric tests: - independent t test, paired t test. Non - parametric tests: - Mann Whitney U test (independent observations), Wilicoxon signed rank test (paired observations) and calculating the correlation coefficient. Linear Regression:- Simple linear regression, its interpretation, model building strategies and diagnostics. Logistic Regression:- Performing logistic regression, interpretation of the output, model building methods and diagnostics. Survival Analysis:- Estimating the survival probabilities, comparison of survival curves, obtaining regression estimates using Cox proportional hazards model, interpretation, model building and diagnostics.